There seems to be a glitch between me and the club today. If you have arrived here with the expectation that there are two $10 Amazon e-gift cards to be given away today, do not be worried. I will still give the cards away. Just leave a comment and I’ll randomly choose 2 winners and post them here later. I’ll need to be able to contact you by email if you win so make sure to include that information for me. 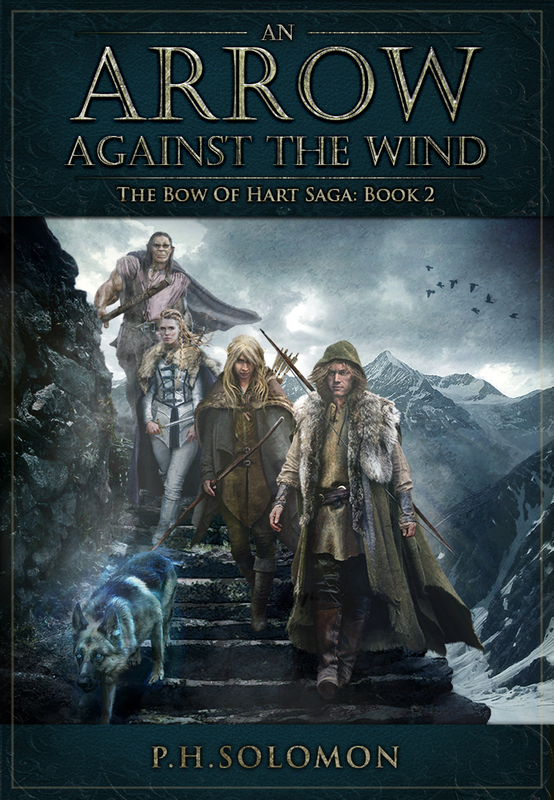 It’s an honor to host today and I’ve had my own exciting week with the release of the latest edition of The Bow of Hart Saga entitled An Arrow Against the Wind. The book was finally released on 4/24 after a long wait on the part of readers and myself with a little announcement here on the blog. There were lots of delays in my life that held me up over the past year but I’ve been able to buckle down the last several months and complete the book. This is the last day of my celebration week and the book is still on sale for $2.99 until the end of the day. It’s been rather exciting for this series over the last 6-8 months as sales for The Bow of Destiny took off last fall and sold in the thousands. During that time, The Bow of Destiny was name the 2016 Book of the Year by Fantasia reviews which completely stunned me. Some other interesting opportunities are available with the series that are in the works but I’ll address those later. However, I do hope to go to print sometime this year. But, An Arrow Against the Wind is out and that’s the biggest news of my week! This book is the continuation of The Bow of Destiny and I think it will be quite exciting for readers. There’s already been a wonderful response from readers this week with the book appearing on a number of Amazon hot new release lists. The hunt for the Bow of Hart continues for Athson and his companions. They have escaped the clutches of Magdronu and Corgren, but they are still pursued. In need of answers to deep mysteries revealed in Chokkra, Athson must gain possession of the mythic bow to face both his enemies and his tragic past. But Magdronu’s reach stretches among Athson’s companions, endangering Limbreth and even Hastra in schemes to entrap them all. With each turn of the search for the Bow of Hart, long hidden secrets surface that threaten to destroy Athson. Will he falter like an arrow against the wind? That’s all I have for today. Thanks for stopping by and here’s a little send-off for everyone who’s been following the club tour all month! Enjoyed your post! Congrats on your award and look forward to reading your book! Thanks for providing a little Ferris Bueller! Thanks, Jan! I wanted to give everyone a fun send-off. Great to see your stories doing so well. Got any secrets to share? Love the Buehler ending too. I tweeted you out and sometimes that helps. Sounds like a potential SE post at a future date. Possibly, I’ve considered it at some point. I’d like to get a better feel for the long-time effect. Thanks for stopping by and for the compliment about the cover. I have a wonderful artist and I give him all the credit! Congrats on the recent release! Thanks for the chance to win an Amazon gift card! I am enjoying reading your book. You are welcome and thanks for reading the book. I pleased you are enjoying it. Looks like I found this right at the tail end. Loved both the Bow ofHart books! Thanks for leaving a comment today, Elizabeth. I’m please you’ve read both and liked them! Do you have a favorite character? I thought it was appropriate, Joan. It has been a crazy month for me with the accident, the tours and the release. I appreciate your visit today. Thanks for stopping by today. I hope you enjoy them! Sorry I didn’t get to this over the weekend. It was a rough of go of it here for the past two days. Hope you had an amazing tour, and good luck with the release. Thanks, Staci. All’s well! Hope you are safe and sound.